Our Frozen Drink Mixes, Wine Slush Mixes, Bar Mixes are available for Retail or Wholesale purchase. Delicious Cocktail drink mixes can be ordered Retail by visiting our retail shopping cart. You will be redirected to the retail shopping cart for a fabulous selection of not only the packaged cocktail and wine slush drink mixes, but also Specialty Salsa, Fruit Salsa, Jams, Condiments, Dip Mixes, Barbecue Sauces and so many more specialty foods. Please feel free to visit our main website of all our products at:www.thecrimsonlion.net where you will be able to advantage of deal packs offering additional savings on certain items. including free shipping on certain products. Frozen drink mixes and Wholesale inquiries, please contact us directly by email, phone or at our company store. 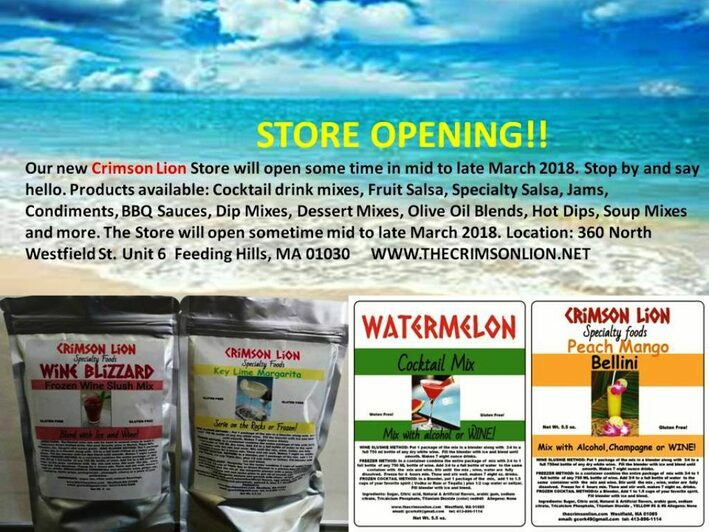 Frozen Drink Mixes and wine slush mixes by The Crimson Lion are available wholesale for those wanting to supplement their income. Whether you desire to sell at your store, craft shows, home shows, flower shows, farmers markets, gift shops, or a home party consultant. It's up to you. These delicious mixes are also very popular for bars and we can help with some bar mix recipes for single serve. Our packaged dry cocktail drink mixes, wine slushies, are carefully blended for an excellent cocktail drink flavor.that has become the premium flavor for frozen cocktails. No need for those bulky bottles any longer. The cocktail drink recipes include conventional spirits such as Rum, Vodka, Gin, or dry Chardonnay or Merlot wine for your favorite drink recipe. The drink recipes are labeled on each package of the drink mix flavor, providing several drink mix recipe options. The frozen cocktail drink mixes are excellent items to start or supplement your income by selling these mixes. The mixes can be sold at craft fairs, home shows, farmers markets, or gift shops fundraising, home parties, bars, restaurants, etc. When combined with our jar and dip mixes, a home party or fundraising becomes an event that will leave everyone satisfied with such an awesome combination of specialty foods and drink. Your delicious cocktail will take only seconds to make just by following the drink recipe instructions on the package. The drink recipes include methods of filling a bag with water and the drink mix. Leave the bag in the refrigerator until it becomes a slush. We also suggest the blender method, where you can easily make a party drink recipe with the mix and ice, complete in just moments and requires no need for refrigeration. Enjoy a frozen drink at the beach bar, at your elegant home cocktail party, or on your next Caribbean get-away vacation. Relax at home, and enjoy a spectacular cocktail with over twenty flavors available.